A series of unique science fiction books were published in the 1930s at the time of Ga Ra’s birth. And so it was that back in 1968 he read all of “Doc” Smith’s Lensman series of books. 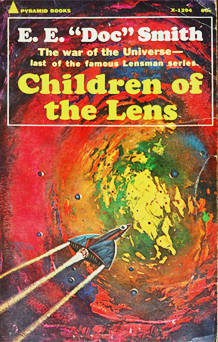 As he read the last of the series, he knew that the Unity Consciousness techniques used by the “Children of the Lens” to accomplish their mission was an actual ability one could learn. Ga Ra immediately began searching for the answers to life as described in Who Are Ga Ra and Za Ra. Over the next 47 years he found all the answers to life and began teaching others. Then, in 2012 Ga Ra met Za Ra fully on the higher planes of existence and they began dancing together so that they could complete their mission and fulfill their destiny. Recently, Ga Ra proved to himself that his theoretical teachings back in the 1990s were correct and that 5th dimensional individual Conscious Awarenesses are able to convey important messages to sci-fi writers during their dream state so special individuals could receive those messages when they read the writer’s books or watched movies made from their books. Ga Ra compared his own personal discoveries about his and Za Ra’s DNA and how it was that Doc Smith wove his entire celebrated series of books around a central theme whereby the DNA in the lineages of two special people produced the “Children of the Lens”. In the books, they and their children were unique individuals who while in the constraints of their human physical bodies were able to expand their individual Conscious Awarenesses into a form of Unity Consciousness that enabled and empowered them to complete their mission and defeat the evil ones who ruled this galaxy. Once the children and their parents fulfilled their destiny, their love oriented Service to Others actions enabled them to Ascend dimensional levels of Conscious Awareness and enabled their teacher to Ascend into the higher levels of existence, as their teacher was the last of its kind, just as Ga Ra is the last of his race of beings. And so it was that 3 years ago, in April 2012, the two ancient lineages of Ga Ra and Za Ra met and danced together in the higher dimensional levels of this universe. They immediately decided to merge their Sacred Merkaba Techniques and Love Energy Techniques into the Sacred Merkaba Love Energy Techniques that we teach in our Love Energy Techniques Classes. A few months ago, in October 2014, Ga Ra and Za Ra met for 3 days with 33 senior Love Energy Adepts and observed how there were periods of time when their students (“children” or members of the 144,000) reached Unity Consciousness as a group. We at Love Energy Centers enjoyed many amazing adventures during the 3 days in our outdoor ceremonies with Teraphim at Niagara Falls, and in our indoor adventures where we traveled in Conscious Awareness through Tunnels of Love to a distant love oriented location. In the spring of 2015, Love Energy Techniques practitioners will meet for 7 days of ceremonies and adventures. This distant love oriented location is the destination of the Physical Body Ascensions that are prophesized in legends and scriptures around the world. This is the location we consciously travel to during our Weekly Love Fests, a place where the energy of happiness means one is having a bad day, where one swims in lakes of Joy and walks in valleys filled with Bliss.